Young children discover new sensory experiences continuously within their environment. Everything is new and exciting, ready to be explored. They feel different surfaces and fabrics. They discover new smells and tastes. Hear different sounds. There are many sensory experiences you can share with your child, as well as make your own baby toys. Take delight in watching your child explore new experiences for the first time. Use cornflour and cold water to make a paste for little ones to squish and swirl this goopy fun. Make in a tray or in warm weather make in a tub or baby bath and let your child sit in the goop. Cornflour is great for babies skin. Make finger paint by mixing cornflour with a small bit of cold water until smooth, then add boiling water, stirring as you add, it will instantly turn into a thick glue, add food coloring to make different colors. Make sure paint has completely cooled before allowing children to play. After all the fun you can take a print of the experience by placing a sheet of paper over the top and hanging up to dry. The best thing about cornflour play is it does not matter if it is eaten as it is food based it is non-toxic. Use food coloring to dye some rice and dry out in the sun. Children will love to run their fingers through it or watch it pour from container to container or through a funnel. My son loves to sit in the tub with the rice and feel it between his toes and through his fingers. Make your own tag blanket. Use soft and shiny fabrics with interesting patterns. Select ribbons of various textures, colors and widths. Place 30cm /12 inch fabric squares right side together. 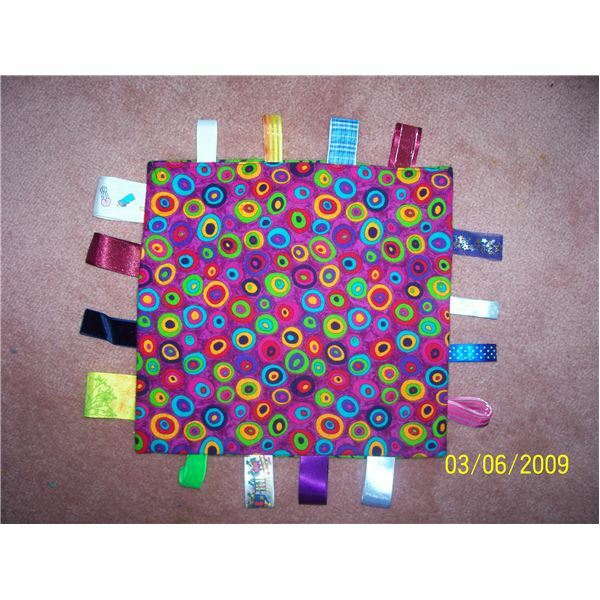 Pin ribbons in loops to 3 sides and sew together. Turn right ways out. Pin remaining side with ribbons and sew closed. Tag blankets are a great snugly comforter for young children. The sense of touch is powerful. Spend quality time with your baby by giving them a massage. You do not need to be an expert. Just choose a time were you are both relaxed. After a babies bath is a good time when baby is not too tired, hungry or full. Make sure the room and your hands are warm. Use a baby lotion or oil. Use gentle strokes to begin with. Use clockwise circles on the stomach. Massage entire body. Remember to include the hands and feet. Massage is a great way to bond with your baby and may have beneficial health benefits. Touch provides comfort and security that can help your child feel more secure in later life. Be creative and provide sensory experiences that enhance development and awareness of the environment around them. Most of all, as you make your own baby toys and participate in the related sensory experiences, have fun and enjoy this time with your young child. There are many toys you can easily make at home that encourages and enhances development in your infant in movement, vision, sensory and language.